A lithograph advertisement by J.W. Brown, Toronto of J. Nourse and Co. published in the Whitby Chronicle. J. Nourse & Co. was located at 121 Brock Street North, in Perry's Block. It was a shop for wholesale and retail groceries, liquors, crockery and glass. 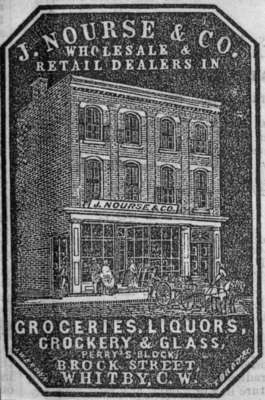 On the lithograph is picture of the outside of the store with people standing in front and a horse-drawn delivery cart. Perry's Block was located opposite the outlet at Elm Street. It was built by John Ham Perry in 1858. The building was destroyed by fire on June 10, 1864 and was replaced by McMillan's Block the same year. J. Nourse and Co. Store Lithograph. 1858, J.W. Brown. Whitby Archives 01-000-004. This image was scanned from a copy negative of the original photograph.